Tim McCanna: Teeny Tiny Trucks Library Launch Party! Teeny Tiny Trucks Library Launch Party! Yes! It finally happened! 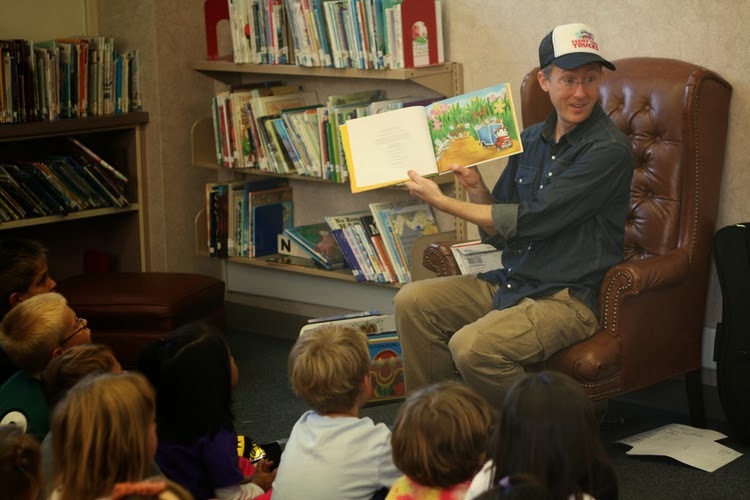 I sat in a library packed with kids and read them a book. Wait, let me rephrase that... and read them MY book! What an absolute joy it was to host my very first book reading for Teeny Tiny Trucks at my children's school library. We kicked things off with an outdoor gathering by the library. We had tables with crayons and Trucks illustrator Keith Frawley's adorable coloring pages. (You can download your own coloring pages at www.teenytinytrucks.com/activities/). Then I warmed up the crowd with trucky twists on popular kids songs, i.e. "Old MacDonald Had a Truck", "She'll Be Truckin' 'Round the Mountain" and "I've Been Truckin' on the Highway." After that, the school librarian, Miss Mabey, gave an introduction and we were off and running! I showed the kids a copy of my original manuscript and briefly explained how it became a published picture book. Then we read Teeny Tiny Trucks, followed by a Q&A session. I was so pleasantly surprised at how great the kids' and the adults' questions were--I couldn't have scripted it better myself. As the kids headed out to do more coloring, I passed around free little truck toys and Trucks bookmarks. Meanwhile, the books were selling like hotcakes! I signed every copy I brought and had to take a handful of orders for more. $2 from every sale went to the Castro Library Fund, so that was nice, too. As things wound down, a couple boys suggested I write "Teeny Tiny Tanks." They made an obstacle course for their toy trucks using their bookmarks as ramps! Click here for their event flyer.